Fishermen suggested the deaths may have been caused by local power stations that use seawater as a cooling agent. The power firms have not commented. Experts are looking into water temperature and oxygen levels and other details to explain the deaths. "We're investigating the Coronel Bay to establish the physical parameters of temperature, electric conductivity and, above all, the oxygen," said local environment official Victor Casanova. Local fishermen blamed nearby power generation plants Bocamina 1 and 2 and Colbun. "I'm 69 years old and started fishing when I was nine, but as a fisherman, I never saw a disaster of this magnitude,'' Gregorio Ortega told local Radio Bio Bio. 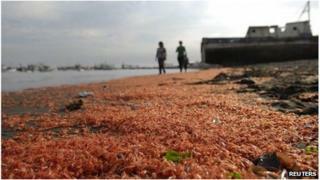 While some blame pollution, others say the death of the crustaceans could be a consequence of the El Nino phenomenon, which warms the waters of the Pacific. Marisol Ortega, a spokeswoman for the fishermen, said she feared the deaths would affect the livelihood of their community. "The way everything is being destroyed here, come the high season in November, we're already thinking we won't have anything to take from the sea," she said.